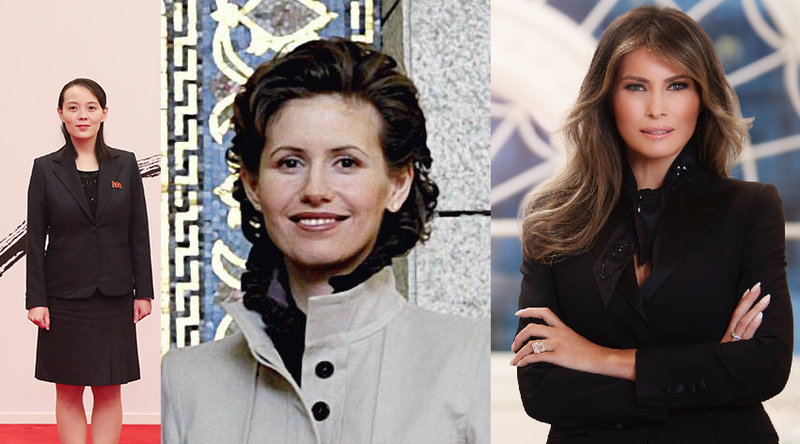 Composite of three photos of Kim Yo-jong, Asma al-Assad, and Melania Trump, by Kim Jinseok (Official photographer of Republic of Korea), Blue House (Republic of Korea), KOGL, https://commons.wikimedia.org/w/index.php?curid=66353266; Ricardo Stuckert/ABr — Agência Brasil, CC BY 3.0 br, https://commons.wikimedia.org/w/index.php?curid=2854074; and By Regine Mahaux, CC BY 3.0 us, https://commons.wikimedia.org/w/index.php?curid=57696382; respectively. And before anyone jumps to the wrong conclusion, they are of unequal size because of the original image source (Melania’s original file is the biggest and clearest), not because of some kind of bias against Kim Yo-jong that I am aware of. If RoK or DPRK decides to release a higher quality photo of Kim Yo-jong for public use, I’m happy to make a composite with a bigger Kim Yo-jong. A few months ago, North Korea threatened to destroy South Korea by fire. Now, however, North Korea sent a delegate to participate in the Winter Olympic in Pyeongchang, South Korea. In addition, Kim Yo-jong, younger sister of Kim Jong-un, the “supreme leader” of North Korea, presented an invitation to the South Korean President, Moon Jae-in, to visit North Korea as soon as possible. In particular, a lot of people are taken in by the grace of Kim Yo-jong and the charm of North Korean cheerleaders. What are we to make of it? As an interested outsider who favours peace on the Korean peninsula (and everywhere else), I can’t help but wonder how sincere North Korea is in its latest peace offering. The threat uttered a few months ago cannot be dismissed out of hand. The best we can hope is that there is a change in direction in North Korea, that now instead of war North Korea tries to make peace. The cynics, in me and in others, however thinks there is absolutely no change in strategic direction at all, it could simply be a change of tactic, to divide the alliance cemented by North Korea’s threat with a wink and a smile. The most appropriate comparison of Kim Yo-jong, I believe is that with Asma al-Assad and Melania Trump. Asma al-Assad is the wife of Bashar al-Assad, President of Syria. As we all know, because of the war in Syria millions of Syrians had to flee their own country, to surrounding countries and into Europe. It started as an armed insurrection against Bashar al-Assad’s government. If you just look at Asma al-Assad’s Instagram account, however, you would never have guessed there is a civil war in Syria. In there she is all happy and smile. How can that be? One conclusion is that the Instagram, and the image of Asma al-Assad, is a public relations campaign conducted by the Syrian government to legitimise the Syrian government. Such tactic worked, for a time, leading Vogue to published a gushing profile on Asma al-Assad in 2011. By comparing established behaviour with transient acts, Kim Yo-jong’s behaviour and the charm of North Korean cheerleaders can be interpreted as tactics to legitimise the North Korean regime, similar to that used by Asma al-Assad and Melania Trump. Kim Yo-jong and North Korea can change this pessimistic conclusion by consistently behaving reasonably and friendly towards their neighbours in the future. In particular, being nice to Donald Trump will try the patience of anyone, but for the sake of the American people, one should try nonetheless. There is further subtext here, that the reporting of Kim Yo-jong and the all female cheerleaders conforms to stereotypes of Asian women, casting them as either submissive or scheming. By comparing Kim Yo-jong with Asma al-Assad and Melania Trump, I hope to point out that to question the sincerity of the peaceful overture of Kim Yo-jong need not conform to any stereotype, but is in itself a legitimate question, given the established behaviour of the regime she belongs to.